Apple is no longer the second largest smartphone brand, after Samsung. 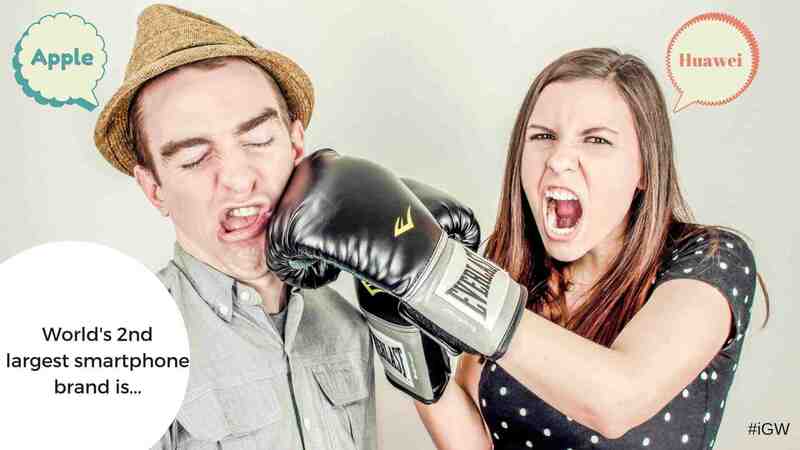 Huawei beats Apple finally and becomes the second largest smartphone brand in the world, as per a new report published by Counterpoint Research. Huawei has been aiming for a long time to become the largest smartphone manufacturer, but till now they had been competing with Apple and if we look at the statistics, Huawei and Apple were too close in August 2016. But now, Huawei has finally done it and now it is the world’s second largest smartphone brand. However, beating Samsung and moving onto the top position will be pretty tough for Huawei as Samsung is way ahead of it. Last year at around the same time, Huawei and Apple both held around 10% of the market share and now, as it seems Huawei is holding a share between 10-15%. Counterpoint Research has not provided any numbers specifically mentioning the shipment amount, so we are assuming that by looking at the graph. In the end of last year, Huawei had claimed that it has beaten Apple already, but this is the first time any such kind of information and statistics are coming from a huge independent research firm. But, still it is doubtful whether Huawei will be able to hold the position for a long time or not, as Apple is set to release the iPhone 8 very soon, and with a huge number of Apple fans and smartphone lovers, around the world and Apple’s presence which is significantly higher than Huawei, Apple may soon again take the second position. Huawei is also ready to launch their Mate 10 and Mate 10 Pro, which was claimed to be exceptionally powerful by the CEO of the brand. 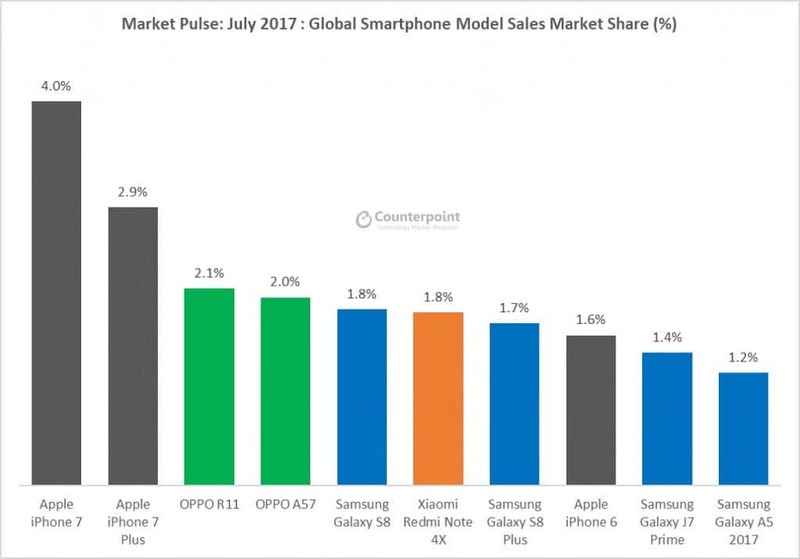 Counterpoint also pointed out the top ten best-selling smartphones in July 2017 and, surprisingly, Huawei didn’t make it to the list as iPhones dominate along with Samsung’s Galaxy S8 and a few other phones from Oppo. 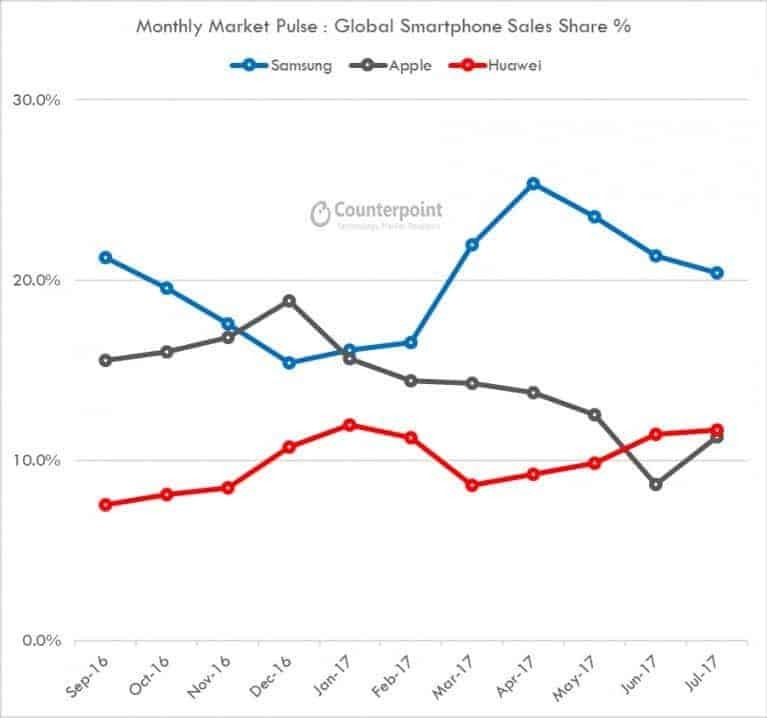 Counterpoint’s Associate Director, Tarun Pathak said that he thinks that Chinese brands like Huawei, Oppo, Vivo, Xiaomi have somewhat restricted the growth prospects of Apple and Samsung as they keep expanding to other markets like the US or Europe and Latin America, while maintaining their dominance in the key market, Asia. He also added that Huawei, Oppo, Vivo, and Xiaomi have successfully gained access to key supply chain partners, which has allowed them to launch designs with bezel-free, full displays, Augmented Reality, in-house chipsets, and advanced camera features and these have kept them close to rivals and helped in this tough competition. Pavel Naiya, Senior Analyst at Counterpoint Research talked a bit about the top selling phones in the month of July 2017 and well, as expected Apple continued to drive its flagship momentum with iPhone 7 & 7 Plus. It was found that OPPO has been one of the fastest growing brands and most of their sales came from their two popular smartphones- The flagship phone OPPO R11 and the mid-ranger OPPO A57, and with that, these phones captured third and fourth spots respectively. Samsung Galaxy S8, Xiaomi Redmi Note 4X, and Samsung Galaxy S8+ are also among the top selling phones of July 2017. Previous articleMovavi Slideshow Maker – A Simple tool to turn your Digital Memories into Movies!